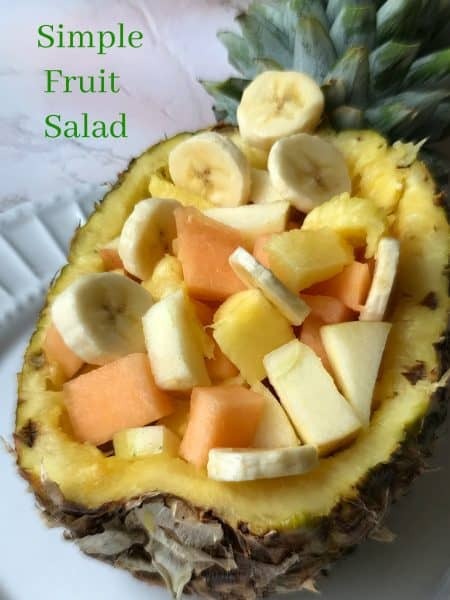 Simple Fruit Salad in Fresh Pineapple shell is something that I have wanted to ‘experience’ for a very long time. 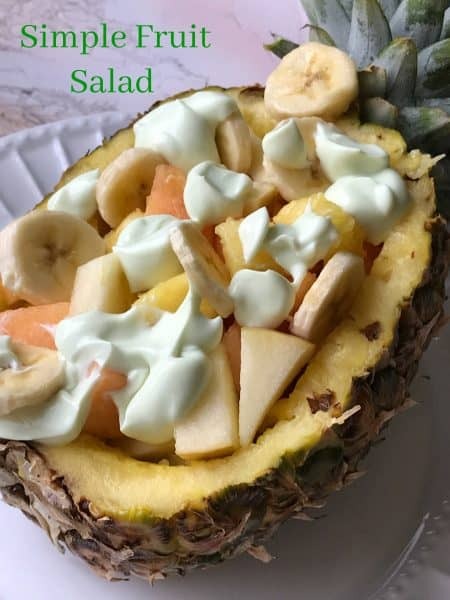 What a lovely way to eat a simple fruit salad, right out of a pineapple shell. What could be better than sitting outside at the patio table, gazing out over the lake, with a gentle breeze blowing softly, birds chirping, bees buzzing and feeling the warm sun wash over your face. 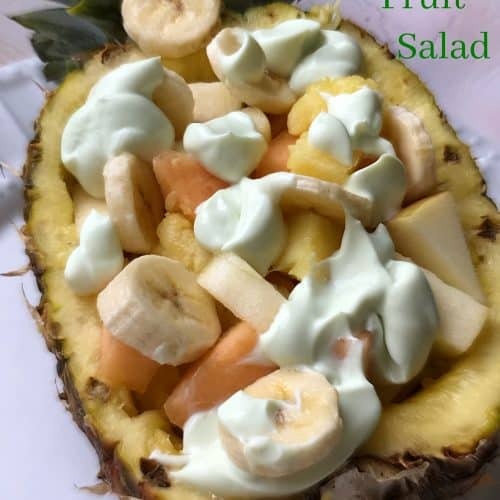 Patiently waiting to savor that first bite of simple fruit salad with a lime yogurt dressing. I must be dreaming because here in Northern WI, we just got literally dumped on. With snow that is. Ten inches of the white, heavy stuff. On top of that, it’s been raining off and on. “So what we have here, is a failure to communicate.” I might as well go on dreaming because I don’t think we’ll be sitting outside anytime soon. Winter is here to stay, at least for another month or so. Time to shut my eyes and get back to my dream.. 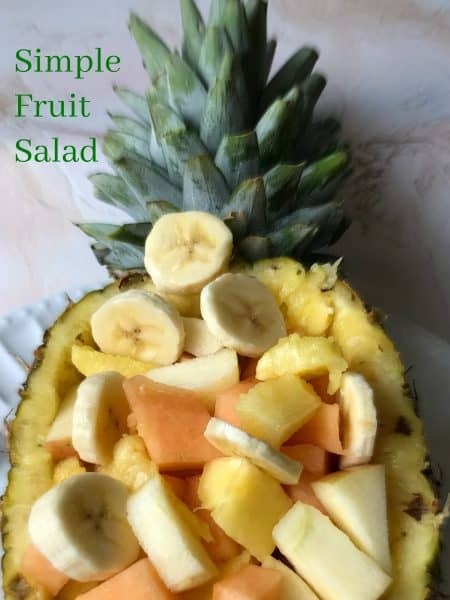 If you don’t intend on making this mouth watering ‘simple fruit salad in a pineapple shell’ shame on you. But if you happen to have a few fresh pineapple shells laying around, don’t throw the shells out. Why? Pineapple shells are perfect for cooking fish or shrimp. The technique is an easy one and one that works really well, especially on the grill. Pineapple and pineapple shells are meant for the grill. If you haven’t tried it yet, you need too. Cut off the top section of the pineapple. Cut the pineapple in half, vertically. After removing most of the pineapple, simply lay your piece of fish or shrimp in the pineapple shell, season with lemon pepper or your favorite seafood seasoning, drizzle fish with lemon juice and cover with foil. Place shell on baking sheet (for the oven) or place directly on the grill. Cook until fish flakes easily with a fork. Serve the fish right from the pineapple shell. Fill pineapple “boats” with any fruit. Grapes, mandarin oranges, even cherries. All berries work super good in this recipe; blackberries, blueberries, red raspberries and strawberries. Ever since my hubby was diagnosed with Diverticulitis a few years back, berries are on a somewhat limited basis in my house, (I’m the only one who eats berries.) With that being said, we’ve turned to the more “tropical” fruits such as kiwi, mangoes, and guava. Here is a simple recipe for grilled pineapple. Remove outer ‘eyes’ from one pineapple. Slice pineapple into rings, remove the inner core. Lay pineapple rings in a shallow pan. Sprinkle lightly with cinnamon. Whisk together 1/2 cup packed brown sugar, 1/2 cup melted butter and 1 teaspoon cinnamon. Spread on pineapple. Allow to sit for 1 hour. Reserve brown sugar mixture. Grill pineapple rings for 20 minutes or until golden brown, basting often with reserved brown sugar mixture. Serve with ice cream and/or angel food cake cubes. 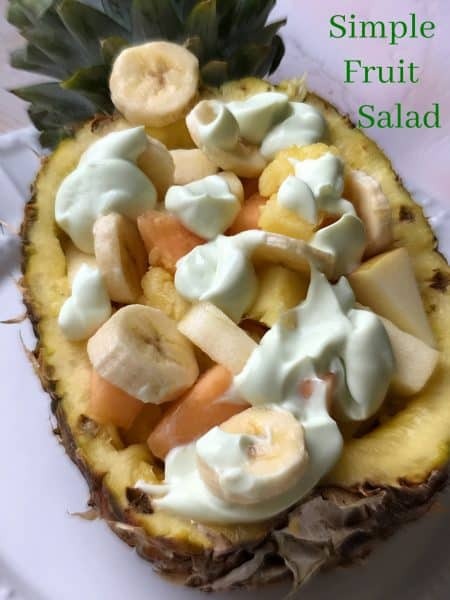 A truly delightful and 'fancy' way to eat a fruit salad. Chop pineapple; place in a large bowl. 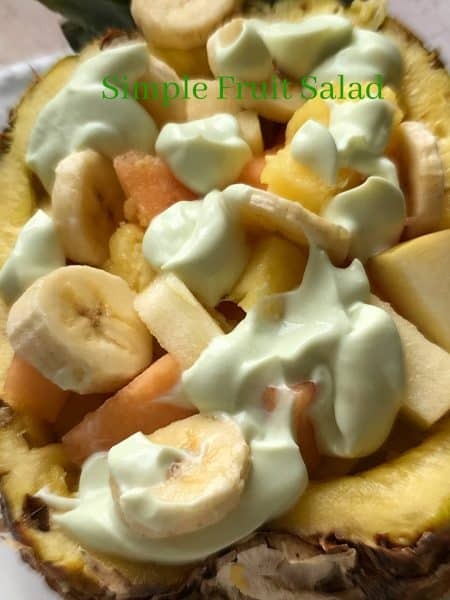 Add the cantaloupe, apple, bananas, coconut, strawberries and blueberries if using; toss to coat. Place in pineapple shell. In a small bowl, combine lime yogurt, honey, lime juice, lime zest and vanilla extract. Drizzle over fruit. Serve Simple Fruit Salad with a chilled Moscato d’Asti or Rod Easthope Reserve Hawkes Bay Sauvignon Blanc 2018. by Rod Easthope. A Lively, fruity and fun wine, that tastes like mangoes doing the tango. Fruit Salads come in all shapes and sizes. Here are a few of our favorites: Winter Fruit Salad and Frog Eye Salad. If your into “Retro Recipes” here’s a blast from the past: Pineapple Jello Rings. Did You Know? Antipasto: Literally, “before the pasta.” Typically, a platter of hot or cold hors d’oeuvre that includes meats, olives, cheeses, and vegetables.